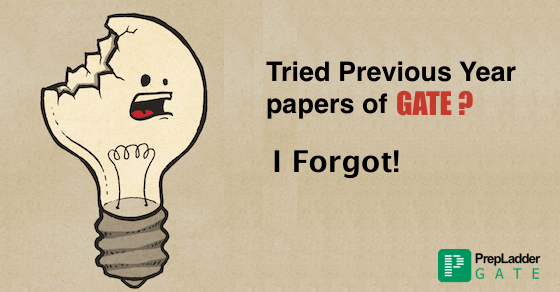 How to Extract the best from GATE Previous Years Papers? GATE exam demands a sound preparation strategy and a focused and dedicated preparation. An essential component of GATE preparation is going through previous years’ papers. This is an essential activity which must be done prior to commencing GATE preparation. This article will cast light on the benefits of solving previous year papers and how to extract the best from previous year papers. In order to assist you in your GATE preparation , We provide daily Free Quiz (chapter wise) , study tips , preparation Tips for GATE 2018 preparation . 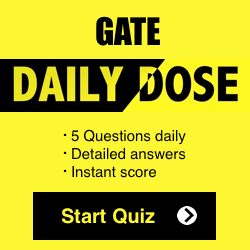 You can subscribe and get daily FREE Quiz (Chapter Wise) , study tutorials and tips delivered on your personal email id to crack the upcoming GATE Exam. Solving previous years’ papers will help you identify the type of questions expected in the GATE exam with their difficulty level. Reviewing previous year papers would help to identify the topic-wise weight age of different topics in the GATE exam. This would help the candidates streamline their preparation in the right direction. Going through the papers would help the candidates’ ascertain the topics and questions which are frequently covered in the GATE exam.The probability of certain questions getting repeated is high and therefore, candidates can boost their GATE score by going through previous papers. Solving previous year papers at various stages of preparation will help you evaluate your preparation level and helps in identifying weaker areas. Solving papers would also help to identify whether you need to work on your speed and accuracy. Previous year papers serve as an aid for the candidates who begin their preparation at the last minute and do not have the time to cover the entire GATE syllabus. Aspirants must not only read but also solve at least 10 previous year papers. This would make them well-versed with what all comes in the exam. Review the previous year papers and take note of the different topics with their weight age perspective. This will help you identify the topics which carry high weight age and others which are relatively less important.Then you can frame your preparation strategy accordingly. Students must attempt these papers at a stretch without taking breaks. Try to attempt the paper like a real exam.Devote proportionate time to each section and develop an attempt strategy. Avoid reading/solving questions randomly from these papers. After attempting a paper, identify the areas where you need improvement and work on them.Identify the areas where you wasted maximum time and where maximum improvement is required. Keep a track of the changes that you observe across different papers. Keep track of the topics which are not asked anymore and if there is a change in how questions from a particular topic are asked. You must not completely rely on the previous year papers since the every exam is unpredictable. There can be some topics which were earlier in the GATE syllabus and have been omitted now. So, review the GATE syllabus carefully in conjunction with solving previous papers. On the finishing front, our advice to the aspirants is to get themselves enrolled in a good Online test series to streamline your GATE 2017 preparation.